Just about anyone who grew up in the mid-20th century probably had some exposure to Velveeta. A two-pound brick of “pasteurized processed cheese product,” the softer-than-normal-cheese was a staple in various recipes, from cheese dips to soups to pastas. Traditional Velveeta still exists as part of the Kraft family of foods, but what may not be as well known is that Velveeta attaches its name to a few other variations on the product. One such variation is a Velveeta Queso Blanco cheese; where traditional Velveeta is meant to imitate American cheese, Velveeta Queso Blanco is meant to imitate a white cheese often used in Mexican dishes. Aldi sells a house brand counterpart to traditional Velveeta in the form of its Regular Buy Clancy’s Cheese Melt. But Aldi also occasionally sells a counterpart to Velveeta Queso Blanco, too. 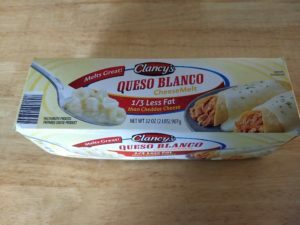 Clancy’s Queso Blanco Cheese Melt, like Clancy’s Cheese Melt, comes in a standard Velveeta-sized two-pound block. It’s an ALDI Find (Special Buy), which means that it only shows up in stores every once in awhile, and when it’s gone, it’s gone until Aldi sells it again. At the time of this post we spotted it on shelves in late January in advance of a certain American football game. As with other processed cheese products, you can find this on the store’s dry shelves, but once you take it out of its foil packaging you should refrigerate it, and you should use it up not too long after that. The package comes with a recipe for Loaded Italian Chips. (See the image above.) We appreciated the fact that the recipe was something we didn’t expect, but for our purposes, we bought the queso blanco hoping to make something a little more Mexican out of it. That led us to a recipe for queso blanco nacho dip … courtesy of the makers of Velveeta. The nacho dip recipe, it turns out, is simple. All you need is the queso blanco, RO*TEL diced tomatoes (or the Aldi equivalent), ground cumin, and fresh cilantro. You can get all of these ingredients from Aldi. Cut up 1 pound — half the block– of the queso blanco into 1/2 inch cubes. Place the cubes in a bowl (or small slow cooker — more on this in a moment) with 1/4 teaspoon of ground cumin (we used 1/2 teaspoon because we like cumin) and 1 can of RO*TEL diced tomatoes. The recipe says to drain the RO*TEL but at least one commenter said the consistency was too thick, so we only partially drained them. Heat up the mix. The recipe directions call for microwaving it for 3 1/2 minutes or until melted and well-blended, stirring after the first two minutes. We opted, instead, to heat it in a small slow cooker for a couple of hours. Once finished, stir in 1/4 cup fresh chopped cilantro and serve. The resulting dip was outstanding. We tried it on nachos and even in some tacos. It’s soft, flavorful, and easy to spoon out. The queso blanco alone or in the recipe would both pair nicely with a chimichanga as well, but it’s pretty well-suited to a number of Mexican dishes. If you’re in the market for a soft version of queso blanco, this fits the bill. It’s easy to use and tastes great. The only downside is that, as an ALDI Find (Special Buy), it’s only in stores on occasion. Still, if you see it and you like queso blanco, we think it’s worth picking up.